Enzyme assays were performed using a homogeneous time-resolved fluorescence assay with recombinant epitope tagged kinase domains (JAK1, 837-1142; JAK2, 828-1132; JAK3, 718-1124; Tyk2, 873-1187) or fulllength enzyme (cMET and Chk2) and peptide substrate. 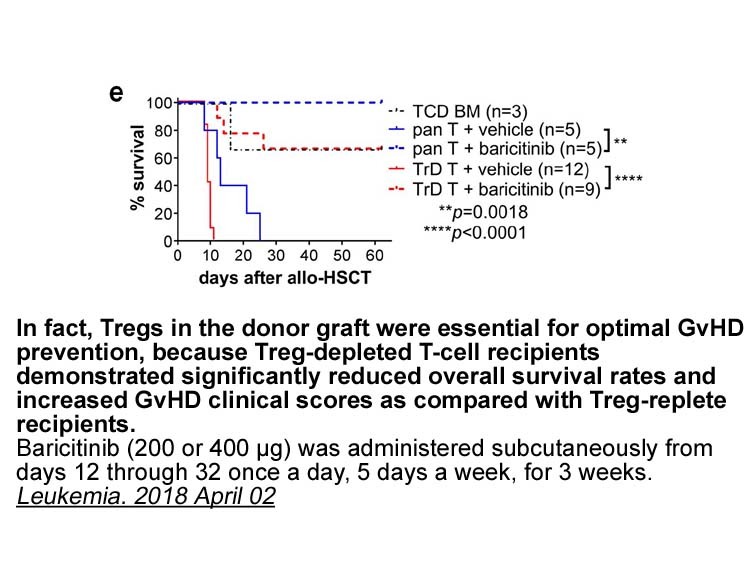 Each enzyme reaction was performed with or without Baricitinib (LY3009104, INCB028050) (11-point dilution), JAK, cMET, or Chk2 enzyme, 500 nM (100 nM for Chk2) peptide, ATP (at the Km specific for each kinase or 1 mM), and 2.0% DMSO in assay buffer. 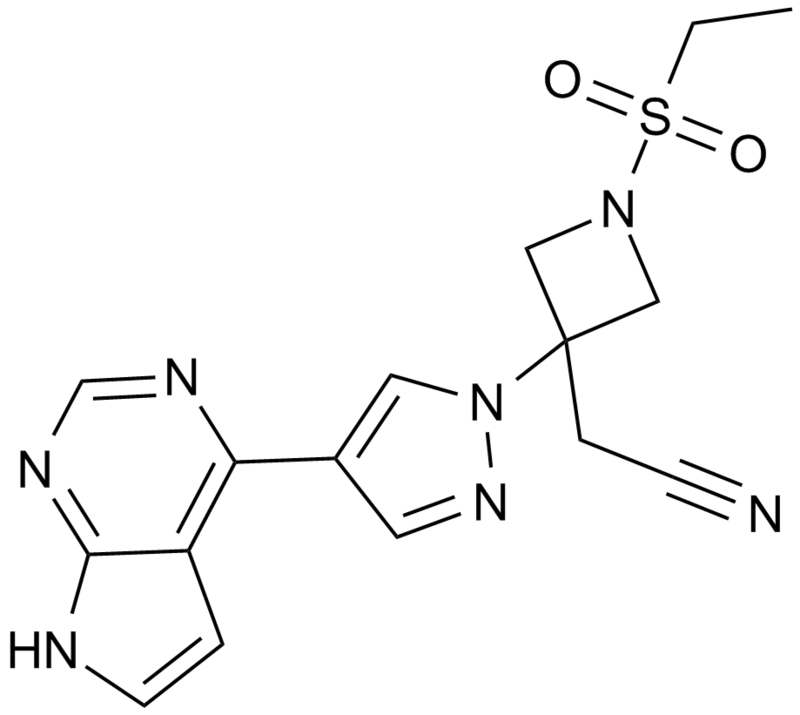 The calculated IC50 value is the Baricitinib (LY3009104, INCB028050) concentration required for inhibition of 50% of the fluorescent signal. Additional kinase assays were performed at Cerep using standard conditions at 200 nM. Enzymes tested included: Abl, Akt1, AurA, AurB, CDC2, CDK2, CDK4, CHK2, c-kit, EGFR, EphB4, ERK1, ERK2, FLT-1, HER2, IGF1R, IKKa, IKKb, JNK1, Lck, MEK1, p38a, p70S6K, PKA, PKCa, Src, and ZAP70. Human PBMCs; PHA-stimulated T cells. 10, 100, 1000, 10000 nM; 48 h.
In PBMCs, INCB028050 inhibits STAT3 phosphorylation stimulated by IL-6 and the production of chemokine MCP-1 with IC50 values of 44 and 40 nM, respectively. In isolated naive T-cells, INCB028050 inhibits STAT3 phosphorylation with IC50 value of 20 nM and inhibits the production of IL-17 and IL-22 with IC50 value of 50 nM. Female rats; adjuvant-induced arthritis rats; DBA/1j arthritis mice induced by bovine type II collagen. Female rats: 10 mg/kg; 24 h; oral gavage.Adjuvant-induced arthritis rats: 1, 3, or 10 mg/kg; once daily for 2 wk; administrated orally.Collagen-induced arthritis (CIA) model: 1, 3, or 10 mg/kg; twice daily for 15 d; administrated orally. Suspended in 0.5% methylcellulose and given by oral gavage at 10 ml/kg. 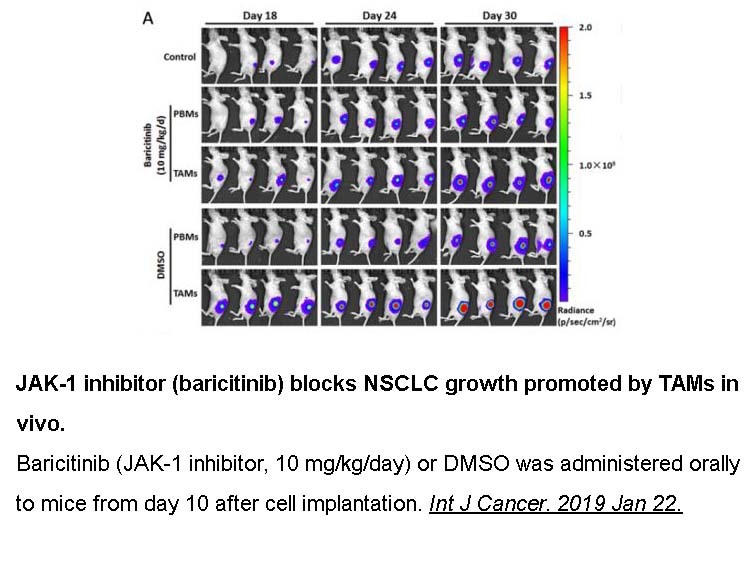 In female rats, INCB028050 (10 mg/kg) inhibits JAK1/2 signaling by ≥50% for 8 h. In rat adjuvant-induced arthritis, INCB028050 (1, 3, or 10 mg/kg) reduces disease scores by 24%, 57% and 81% respectively and inhibits the increase of hind paw volumes by 50%, >95% and >95%, respectively. Also, INCB028050 reduced bone resorption. In CIA mice model, INCB028050 (1, 3, or 10 mg/kg) reduces clinical scores by 19%, 67% and 61% respectively and inhibits IL-6 and IL-23 signaling and function.